Dante Alighieri (1265-1321). 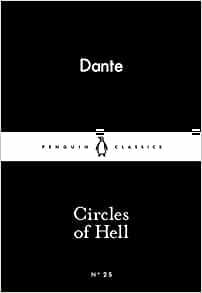 Dante's works available in Penguin Classics are Inferno, Purgatorio, Paradiso, The Divine Comedy and Vita Nuova. Start reading Circles of Hell (Penguin Little Black Classics) on your Kindle in under a minute. Durante degli Alighieri, simply called Dante, was a major Italian poet of the late Middle Ages. His Divine Comedy, originally called Comedìa and later called Divina by Boccaccio, is widely considered the greatest literary work composed in the Italian language and a masterpiece of world literature. In Italy he is called il Sommo Poeta ("the Supreme Poet") and il Poeta. He, Petrarch, and Boccaccio are also called "the three fountains" and "the three crowns". Dante is also called "the Father of the Italian language". These are little books of excerpts, I think I was just expecting 'more' somehow. Not the sellers fault, they are exactly as described but I wouldn't have bought these if I had picked them up in a book shop. this was so much fun to read !!! felt like i was the nervous guy walking through it all, perfect mix of mythology and current story, written so well it flows like a song ! 5.0 out of 5 starsGreat wee gift for a poetic soul. Lovely, poetic wee snippet of Dante's work.